In this class you will learn basic poses along with the various techniques to enter and exit the hoop, conditioning, strength and flexibility exercises. Our goal is for you to learn how to safely mount and dismount the hoop while having some fun. No experience necessary. You will gain strength, flexibility, and balance as you continue to improve your skills on the hoop. You will begin to learn combinations as you learn more advanced moves. You will learn how to use the fabric with your body to create various positions and while relying the fabric. You will learn basic conditioning exercises, climbs, foot locks and close to the ground poses in this introductory level class. No experience necessary. This class will continue building stamina, strength, and stability. You will begin to build combinations and more complex poses. Starting with review of basic skills, this class will progress into various positions, inversions, and sequences. This class is open to students who have taken at least 2 pole 1 classes. We will focus on creating routines and flowing through a variety of movements. We will use static and spin pole. In this introductory level, you will discover the basics of Pole Fitness and conditioning moves to build your strength on static and spin pole. 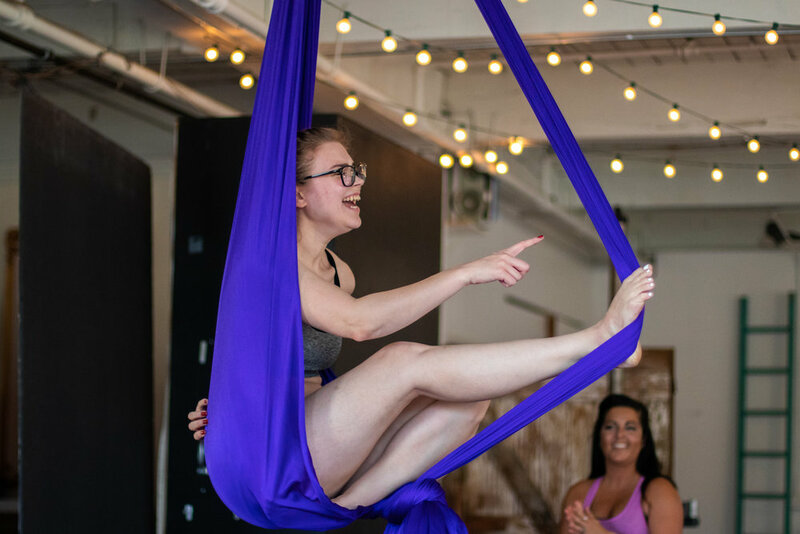 In this class you will learn how to spin, climb, and move smoothly up, down and around the pole as well as build your strength to prepare you for inversions. You will learn basic inversions such as Brass Monkey, Shoulder Mounts, Leg Hangs, and Handsprings. This class focuses on controlling moves, muscle condition, and building strength to prepare you for combinations and tricks. This class is for students who feel very comfortable with inversions, leg hangs, climbing and basic spin pole moves. Get ready to take your pole skills to the next level with this class as we begin to combine a variety of moves together while increasing your strength, flexibility, and stamina. Hammock is an aerial fabric hung in a U shape. This class will teach basic mounts, poses, drops and choreography from a sitting and standing position. Conditioning and flexibility exercises using the apparatus and on the floor will be included. Beginner students will learn the basic positions. No experience necessary. The class will focus on learning more advanced skills as well as creating sequences to promote endurance and fluidity on the apparatus. Further development of strength and flexibility will support quicker and safer advancement of skills. Exploration of drops and movements stemming from hip key, straddle-ups, and crochet will be some of the highlights of the class. Stretching is something we focus on in each one of our classes, however, in order to achieve true flexibility, we have decided to dedicate a whole hour to it! In class, we will focus on stretching for our splits and our backs. Increasing your flexibility helps with poses on all apparatus.